As President Trump held his first official full Cabinet meeting at the White House on Monday, the on-camera portion of the meeting showed the members of his Cabinet lavishing praise on the president. 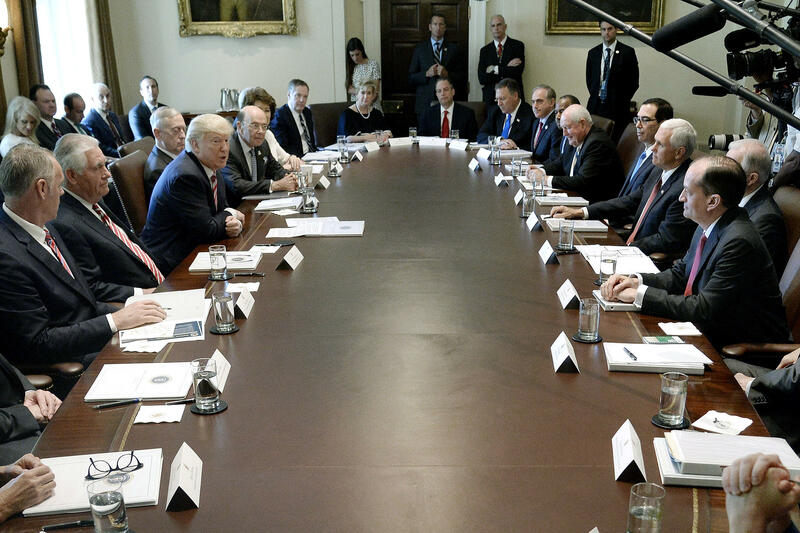 After Mr. Trump summed up his administration's ongoing efforts and goals, amid a flurry of investigations and probes into Trump associates' ties to Russian meddling in the election, he invited his Cabinet to introduce themselves. Vice President Pence started by calling it the "privilege of his life" to be vice president. "It is the greatest privilege of my life to serve as vice president. The president is keeping his word to the American people and assembling a team that's bringing real change, real strength," said Vice President Mike Pence. U.S. Ambassador to the United Nations Nikki Haley said this: "It's a new day at the United Nations. We now have a very strong voice. People know what the United States is for, they know what we're against and they see us leading across the board." It was White House Chief of Staff Reince Priebus' effusive comments to Mr. Trump that caught the attention of social media. "On behalf of the entire senior staff around you, Mr. President, we thank you for the opportunity and the blessing that you've given us to serve your agenda and the American people," Priebus said. "And we're continuing to work very hard every day to accomplish those goals." Defense Secretary James Mattis directed his words of praise to his department, rather than to the president. "[I]t's an honor to represent the men and women of the Department of Defense," he said. "And we are grateful for the sacrifices our people are making in order to strengthen our military so our diplomats always negotiate from a position of strength." After the Cabinet meeting, Sen. Charles Schumer, D-New York, and some of his staff spoofed the Cabinet session. They sat around a table complimenting the Senate minority leader's appearance on "Face the Nation," his hair, and one particular staffer's glowing comments, offered praise that mirrored Priebus' -- causing the table to erupt in laughter. Weekly Standard editor Bill Kristol, who's no fan of the president, said in one tweet that he had "never seen this kind of collective sycophancy," and in another drew a comparison with the kind of meeting that might be held in authoritarian North Korea. Dennis Rodman going to North Korea to inform Supreme Leader of success of Donald Trump's experiment in North Korean-style Cabinet meetings. Mr. Trump later hailed the meeting on Twitter as a "great team" that will being "real change to DC."